The Sovrin Foundation is pleased to announce the beginning of the public review period for the Sovrin Governance Framework V2. As the “constitution” of the Sovrin Network, this set of documents specifies the purpose, principles, and policies that govern Sovrin as a global public utility for self-sovereign identity. The first version of the Sovrin Governance Framework was called the Sovrin Provisional Trust Framework. It was originally approved by the Sovrin Foundation Board of Trustees on 28 June 2017 and has served as the legal foundation for the Sovrin Provisional Network from the point it went live on 31 July 2017. The Sovrin Governance Framework V2 (SGF V2) represents a year’s worth of work by over 20 members of the Sovrin Governance Framework Working Group to create a stronger and more comprehensive set of principles and policies governing the business, legal, and technical requirements of the Sovrin Network. The diagram of the component documents below shows the new legal architecture of the SGF V2. The “constitutional” layer consists of the Sovrin Governance Framework—the master document referencing all the others—and the Sovrin Steward Agreement—the legal agreement between the Sovrin Foundation and a Sovrin steward. The “legislative” layer consists of the Sovrin Glossary V2—the industry’s most comprehensive glossary of over 200 self-sovereign identity terms—and the Controlled Documents—specific sets of policies governing steward operations, Sovrin economics, and the Sovrin trust mark. An additional document, the Sovrin Trust Assurance Framework, defines criteria and processes for assessing conformance of different Sovrin actors to the policies of the Sovrin Governance Framework. Lastly, the Sovrin Governance Framework Working Group is currently producing a white paper, The Sovrin Web of Trust Model, that will serve as a comprehensive overview of the Sovrin Governance Framework V2 and the new decentralized trust model enabled by self-sovereign identity infrastructure. This white paper is expected to be published in late November. 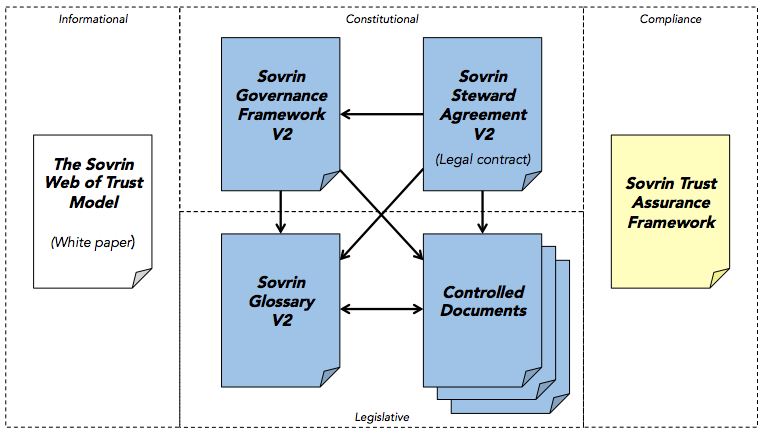 All these Sovrin Governance Framework V2 documents are now available for open public review. The review period will run from November 1 to November 26. Anyone with Internet access can view and comment on the documents by following the instructions on the Sovrin Governance Framework page on the Sovrin Foundation website.